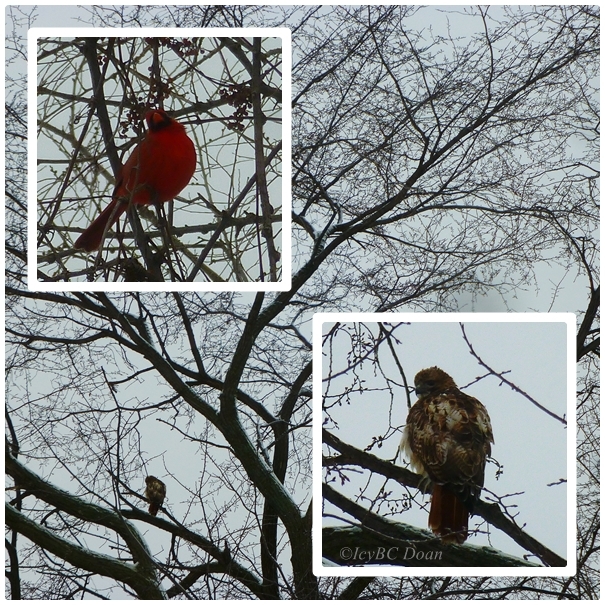 For the first two days of February, I had a cardinal and a hawk visiting the backyard. It got warm up a little over the weekend during the day, and freeze the slush by evening. We had a sheet of ice running down the driveway. Hawks are magnificent birds, but I'm glad I haven't one in the yard for over a week. I hate to see it take down a songbird. Both the cardinal and the hawk are great visitors. But, I hope that the hawk didn't stick around for long. Have a happy day and week ahead! Wow - very cool visitors! Wow, thats cute visitors. I’m in love with wild birds. Thanks 4 sharing in the project. Thanks for dropping by and visiting me! I've seen lots of cardinals back home in Toronto but not hawks. And cardinals, of course they're a favorite...so pretty.